Now, let’s take things a step further and talk about how you close an article. Every article you write should have an author's bio, strategically written to look like a continuation of the article itself. The whole purpose of writing an article is to have your reader read your bio and decide to click to your website for more information. Your article may be great and your conclusion strong, but without a powerful resource box that asks for an interaction (read; click), you will fail to get any traffic. A resource boxes with just a few words like, "Written by John Doe" won't bring you any traffic. Make your resource box entry stand out. 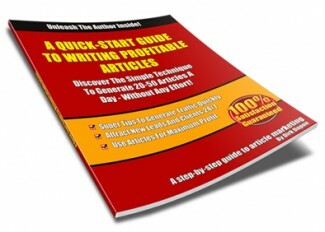 Many people write a great article, submit it to article directories and wait for the traffic to come. But sadly, nothing appears, and they think, "article marketing is a load of rubbish!" These people don't realize that they have probably made one of the most fundamental mistakes that new articles writers make; not using the resource box to its full potential!